Cucumbers are a favorite addition to green salads. 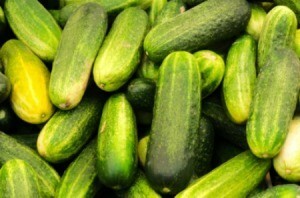 This is a guide about selecting good cucumbers. Tired of your bathroom mirror fogging up after a shower? Try rubbing a cucumber slice along the mirror, it will eliminate the fog & provide a soothing, spa-like fragrance. Looking for a fast and easy way to remove cellulite before going out or to the pool? Try rubbing a slice or two of cucumbers along your problem area for a few minutes, the phytochemicals in the cucumber cause the Collagen in your skin to tighten, firming up the outer layer and reducing the visibility of cellulite. Works great on wrinkles too! Have an important meeting or job interview and you realize that you don't have enough time to polish your shoes? Rub a freshly cut cucumber over the shoe, its chemicals will provide a quick and durable shine that not only looks great but also repels water. Stressed out and don't have time for massage, facial or visit to the spa? Cut up an entire cucumber and place it in a boiling pot of water, the chemicals and nutrients from the cucumber with react with the boiling water and be released in the steam, creating a soothing, relaxing aroma that has been shown the reduce stress in new mothers and college students during final exams. Just finish a business lunch and realize you don't have gum or mints? Take a slice of cucumber and press it to the roof of your mouth with your tongue for 30 seconds to eliminate bad breath, the phytochemcials will kill the bacteria in your mouth responsible for causing bad breath. Looking for a "green"; way to clean your faucets, sinks, or stainless steel? Take a slice of cucumber and rub it on the surface you want to clean, not only will it remove years of tarnish and bring back the shine, but it won't leave streaks and won't harm your fingers or fingernails while you clean. Using a pen and made a mistake? Take the outside of the cucumber and slowly use it to erase the pen writing, also works great on crayons and markers that the kids have used to decorate the walls! I have always loved cucumbers, now I love them even more, hope you enjoyed the tips about cucumbers which are really inexpensive this time of year. Source: This information was in The New York Times several weeks ago as part of their "Spotlight on the Home" series that highlighted creative and fanciful ways to solve common problems. Cut the stem end of your cucumber off, about 1/2-1 inch, using a sharp smooth knife. Do not discard but place back on the cucumber and rub together in a circular motion. A white substance will be drawn out of the cucumber. Keep doing this until no more comes out. Your cucumber will be sweet again. Note: I've only had one bitter cucumber that this didn't work for. Some friends shared this with me about 30 years ago and it amazes me every time I do it. But it works great!